Sleep Apnea relieved by playing didjeridu. I'm excited to announce that I am working with local dentists and health care professionals to assist patients in healing obstructive sleep apnea. My 15+ years of teaching experience has turned hundreds of people of all ages on to the joy and benefits of playing didjeridu. Contact me if you are wanting to take your didjeridu playing to new and exciting levels! Next four week series: To be announced! Below is a video of the Swiss Study published by the British Medical Journal on how playing the didjeridu can assist in curing moderate obstructive sleep apnea disorder. For my 5th year, I'll be facilitating didjeridu playshops Friday-Sunday at the California World Fest music festival in Grass Valley, Ca. July 14th - 17th, 2016. 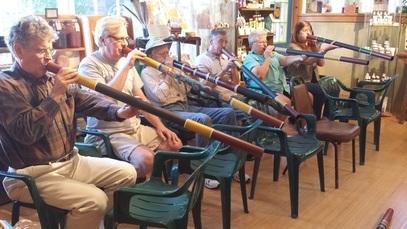 Once you begin to play the didjeridu you will find a new and refreshing connection to the world around you. From the sounds of nature to the rhythms of civilization, sound will become a wonderful expression of life. You will get to know your breath on a deep level and "remember" the art of circular breathing. Once you dive into this ancient sound, you may be inspired to learn more about the culture to which it originates, the Yolngu of Northeast Arnhemland, Northern Territory, Australia. I am honored to share my knowledge and nearly two decades of playing and teaching the didjeridu (yidaki). Please enjoy this video of one of my favorite players: Video @ bottom of this page. I really appreciate the video below for its content. It is clear that a younger generation is taking to heart the traditions of yidaki, song, bilma, and dance. Check out IDIDJ australia on youtube for more informative videos.